Friday, March 9, 2018, 8 a.m. – 5 p.m.
A young person you know could be experiencing a mental health or substance abuse problem. Learn an action plan to help. Sometimes first aid isn’t a bandage, or CPR or calling 911. Sometimes the first aid is YOU. Anyone 18 or older can take this course, but it is recommended for those who regularly have contact with young people ages 12-18: teachers, coaches, social workers, faith leaders, and other caring citizens. Course will be held at the Shawnee Community College Metro Center, Room 105, located at 5385 Industrial Park Road, Metropolis. To register, please email the information below to jelliot@fccinconline.org. If you do not have access to email, call Joe Elliot at 618-734-2665 or fax the information to 618-734-1999. This entry was posted in Bee Healthy on February 24, 2018 by massacbeeswax. 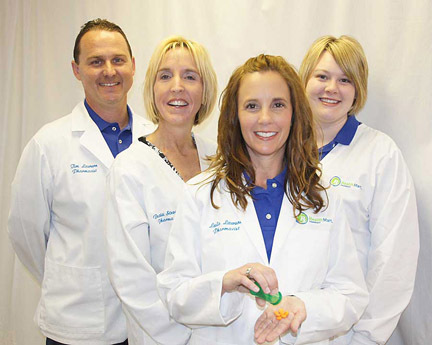 Your December Bee Healthy Tip from the trusted team at Metropolis Drugs II: from left: Tim Lawson, Dacia Stewart, Leslie Lawson and Lauren Scott. I’m guessing that the flu isn’t on your top-10 wish list, right? But just in case you get sick this flu season, here’s a list of 10 things you can do to help ease your symptoms—and to stop the flu in its tracks and protect others. Stock up. A few supplies may make it a bit easier to manage the flu. It’s best to have these on hand before you get sick. Otherwise, send a healthy member of your family out on an errand, if you can. Stay home! The first day you have symptoms, you may be tempted to venture out to work or school. Please don’t! Not only do you need the rest, but this is also when you’re most contagious. Try to nap—and read or binge-watch your favorite television episodes. Prevent the spread In addition to staying home, wash your hands often and cover your cough and sneeze into your sleeve. Drink fluids, breathe steam. This is a great way to thin your mucus, making it easier to cough up. This may help prevent a lung infection. Using a humidifier (a cool mist) or breathing in steam from a hot shower may also help ease congestion. Calm your cough. It can be exhausting, I know. Try over-the-counter (OTC) cough medicines—an expectorant helps thin mucus. Do not give a child under age 4 any type of cough medicine. Sucking on lozenges may also help your cough or scratchy throat. Ease nose woes. You—or your kids—can try saline nose drops or sprays to ease nasal congestion. First, put a few drops into one nostril. Then gently blow the mucus and saline out. Repeat on the other side. Treat other symptoms. Sure, a fever—along with chills and achiness—is a sign your body is fighting off the virus. But that doesn’t mean you need to suffer in silence. Ask me if you have any questions about which fever reducer to take. But don’t forget: Never give aspirin to someone younger than 19—it can lead to a serious illness. Talk to us here at Metropolis Drugs II. And of course it goes without saying: If you need guidance about any products—or any questions whatsoever—let us know, and we’ll try to steer you in the right direction. WebMD: “10 Tips to Ease Flu Symptoms.” Available at: http://www.webmd.com/cold-and-flu/flu-guide/coping-with-flu#1 Accessed 8-31-17. Public Health: “Treatment of Flu.” Available at: https://www.publichealth.va.gov/flu/treatment/ Accessed 8-31-17. Open Mon.-Fri., 8:30 a.m. – 6:00 p.m. This entry was posted in All the Buzz - Bee Informed, Bee Healthy on December 10, 2017 by massacbeeswax. Your November Bee Healthy Tip from the trusted team at Metropolis Drugs II: from left: Tim Lawson, Dacia Stewart, Leslie Lawson, and Lauren Scott. (RxWiki News) Your dog may benefit your child’s health, according to two new studies. One new study found that babies whose mothers had a dog while pregnant may have increased protection from allergic eczema. The other new study found that children who are regularly exposed to dogs may see a decreased risk of asthma. The authors of one of these new studies pointed out that eczema is common in infants but can lead to asthma and food and nasal allergies. Eczema is marked by red, itchy rashes. Mothers who were exposed to a dog indoors for at least an hour a day while they were pregnant were likely to give birth to babies with a lowered risk of eczema, one study found. However, this lowered risk appeared to fade at age 10. The second study found that dogs may carry certain elements, such as bacteria, that protect children from asthma. However, the protein that causes allergic reactions to dogs may cause asthma symptoms in children with a dog allergy. The authors of this study pointed out that children who are allergic to dogs should not be exposed to dogs. They did not identify the specific elements dogs carry that might protect non-allergic children from asthma. To reduce dog allergens in your home, experts recommend bathing your dog at least once a week, washing your hands after petting the dog, restricting the dog’s access to a few rooms in your home, and using air filters and vacuum cleaners regularly. If you are concerned about your child’s risk for eczema, asthma or allergies, talk to your child’s pediatrician. And when you need help finding the right medications for your children, talk to us at Metropolis Drugs II. These studies were published in the Annals of Allergy, Asthma & Immunology. Information on study funding sources and potential conflicts of interest was not available at the time of publication. This entry was posted in All the Buzz - Bee Informed, Bee Healthy and tagged Metropolis Drugs II on November 6, 2017 by massacbeeswax. Even healthy people can get very sick from influenza (flu) and can spread it to others. The U.S. Centers for Disease Control and Prevention estimates that flu-related hospitalizations since 2010 have ranged from 140,000 to 710,000 annually, while flu-related deaths have ranged from 12,000 to 56,000. During flu season, flu viruses circulate at higher levels in the U.S. population. (“Flu season” in the U.S. can begin as early as October and last as late as May.) Getting an annual flu vaccine is the best way to reduce your risk of getting sick with flu and spreading it to others. When more people get vaccinated against flu, it spreads less easily through a community. Flu vaccines cause antibodies to develop in the body about two weeks after vaccination. These antibodies provide protection against infection with the viruses that are in the vaccine. The flu vaccine is given annually and it changes slightly from year to year. The vaccine protects against the influenza viruses that research indicates will be most common during the upcoming season. While it may not protect against all strains of influenza, it can lessen the severity of the infection by preparing the immune system for a similar strain. This entry was posted in All the Buzz - Bee Informed, Bee Healthy on October 2, 2017 by massacbeeswax. Your September Bee Healthy Tip from the trusted team at Metropolis Drugs II: from left: Tim Lawson, Dacia Stewart, Leslie Lawson and Lauren Scott. Developing healthy posture now is an important gift to give yourself. The benefits will last a lifetime! Keep your weight down. Excess weight exerts a constant forward pull on the back muscles and stretches and weakens abdominal muscles. Avoid staying in one position for long periods. Inactivity causes muscle tension and weakness. Sleep on a firm mattress and use a pillow that is just big enough to maintain the normal cervical (neck) curve. Avoid using an oversized pillow or several pillows. Bend your knees when picking something up or putting it down. Carry a heavy object by using two hands and keeping the load close to your waist. Wear comfortable, supportive shoes. Avoid continuous use of high-heeled or platform shoes, which throw the back’s natural curves out of alignment. and allow arms to swing naturally. This entry was posted in All the Buzz - Bee Informed, Bee Healthy on September 3, 2017 by massacbeeswax. Bee Healthy Tip: Kids and Sleep – How Much Is Enough? What happens when your kid doesn’t get enough sleep? Does he turn into Oscar the Grouch? Not a surprise, really. But moodiness isn’t the only downside of a lack of shuteye. This entry was posted in All the Buzz - Bee Informed, Bee Healthy and tagged Bee Healthy, Children, Metropolis Drugs II, Sleep on July 23, 2017 by massacbeeswax.